Birthstones in general are thought to have begun with the biblical breastplate of Aaron (around 1300 B.C.) – a garment set with 12 precious stones – and it is believed that each stone was associated with a zodiac sign (like in Vedic astrology and Ayurvedic medicine). The tradition of associating specific gemstones with particular months is rumored to have begun in Poland in the 1700s, and the list as we know it today here in the US was adopted as a standard by the National Association of Jewelers in 1912. While most agree on which stone(s) go with which month, there are some variations. 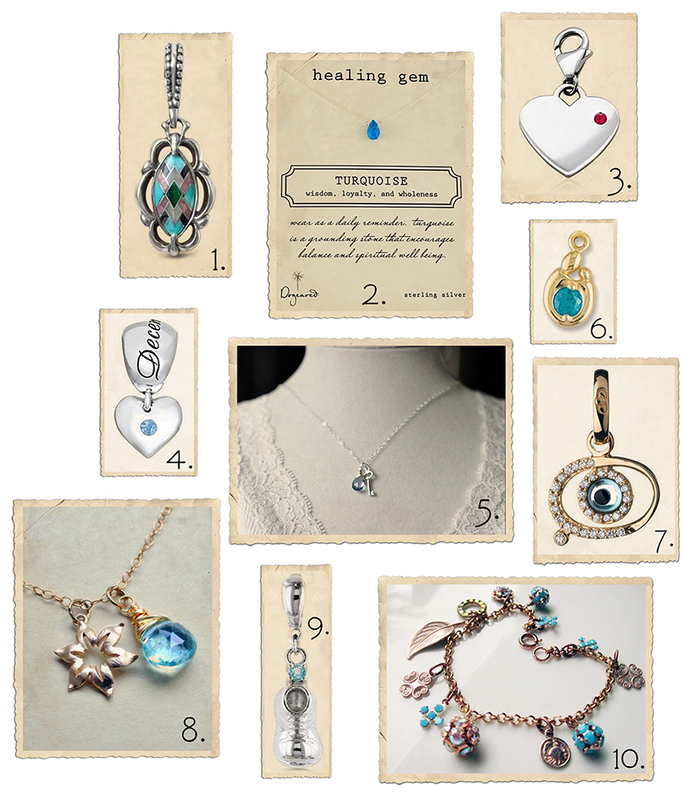 For December, the standardized stones in the modern tradition are Tanzanite, Turquoise and Zircon. Some also include Blue Topaz, but in several ancient traditions (as well as Ayurveda), Ruby is the stone for this month. So the December birthstone color is mainly variations of blue, with the blood red ruby as an exception. A mineral discovered in Tanzania as late as 1967, Tanzanite (scientifically known as blue Zoisite) didn’t become an official birthstone of December until 2002 (and is the only addition to the original list from 1912). Its natural color is a brownish red, and it takes a good bit of heat to bring out that purple/deep blue color. It was discovered after a wildfire on the slopes of Mt. Kilimanjaro by geologist Manuel D’Souza who brought it to Tiffany & Co’s attention. They re-named the Zoisite “Tanzanite” and brought it to the market with great success. It is a popular, rare and consequently expensive stone – it is only found in Tanzania and once the supply is gone, it’s gone. Tanzanite is also the anniversary gemstone for the 24th year of marriage. Tanzanite is said to help open the heart and third eye chakras and aid in communication with the spiritual world. The word Zircon derives from the Arabic and means gold and color, and Zircon (not to be confused with cubic zirconia) does come in a variety of colors. Its natural hues are in the brown, orange and red family, but it also comes in green and yellow and, with the help of heat treatment, clear and blue. The clear variety has long been used as a diamond imitation, but today, the most popular hue is blue (a very pretty light pastel aqua color). Zircon can be found in many places around the world (although most are mined in Cambodia, Thailand and Vietnam), and it is a relatively inexpensive, and very popular, gemstone. Pure Topaz is clear as glass, but thanks to a variety of impurities, it also comes in many colors, including red, pink, brown, yellow (November’s birthstone), orange, purple, green and blue. The blue variety is the most popular one, and while it does sometimes occur naturally, the blue color is most often achieved with the help of irradiation (radiation) and heat treatment. The resulting colors range from a pale baby blue (known as Sky Blue) to the crisp Swiss blue to a nice, rich deep, almost teal, blue (called London or Super Blue). Blue Topaz, which is also the anniversary gemstone for the 4th year of marriage, is available in abundance, and as with all gemstones, the price depends on the purity and size of the stone, but in general, it is quite affordable. Blue Topaz is said to balance one’s emotions, bring mental clarity, truth, abundance, joy and love, and help the third eye’s ability to see at a higher level. Other topaz healing uses include wounds and eating disorders. Turquoise is one of the oldest known gemstones, used and appreciated for thousands of years, not only for its beauty, but also because it was believed to be a good luck talisman. Turquoise is of course turquoise, and it gets its blue-green color from copper. There are other, less common, variations on the color such as a deeper blue-green and bright green, and the color depends on the chemical composition of the earth where it is formed. The best quality Turquoise is a solid robin’s egg blue with no discolorations or veins, and most of these can be found in Iran and the southwestern part of the US. Turquoise, which is also the 11th wedding anniversary gemstone, is plentiful and affordable. An important stone in crystal healing, turquoise is thought to protect the (physical) body, help the chi flow and combat depression. It helps with communication and creativity and strengthens the immune system. It is also believed to bring friendship, courage, a long life, happiness and good luck. The popular Ruby is the birthstone for December in the Ayurvedic and Traditional system. In the modern, standardized list of birthstones, it is the stone for July, and it is also the 40th wedding anniversary gemstone as well as the zodiac birthstone for Capricorn. It is the red variety of the mineral corundum (a crystalline form of aluminum oxide) – all other corundum colors are called sapphires. The red color is the result of the (natural) addition of chromium, and colors range from light pink to deep red. Most rubies are heat treated to bring out richer color and more clarity, and the darker the color, the more valuable the stone. It is an expensive gemstone (several thousand dollars per carat for top-notch stones) – a ruby bracelet owned by Marlene Dietrich sold at Sotheby’s in 1992 for $990,000 (it was admittedly jawdroppingly stunning, but still!). Ruby stimulates the heart chakra and is said to protect the heart from emotional suffering, aid in making wise decisions, promote happiness, a positive outlook, and ideal relationships. It is also thought to help with detoxification, eye problems, heart conditions, remove infections in the blood, reduce nightmares and depression and ward off evil spirits.